Mazda 6 Forums : Mazda 6 Forum / Mazda Atenza Forum > Technical / Performance / Model > Mazda 6 1st Generation (2002-2008) > Engine / Drivetrain > 3.0L V6 > Help! Codes P2227 and P1487! @b1lk1 I'll check into it. I haven't touched the air box at all so I suspect that if this is the issue, the sensor had failed. Do you know how to test the sensor/motor? P1487 has NOTHING to do with the EGR valve. You are using generic codes definitions. For us, this code is for the variable intake air valve (not sure if this is exactly right) that is attached to teh side of the factory airbox. 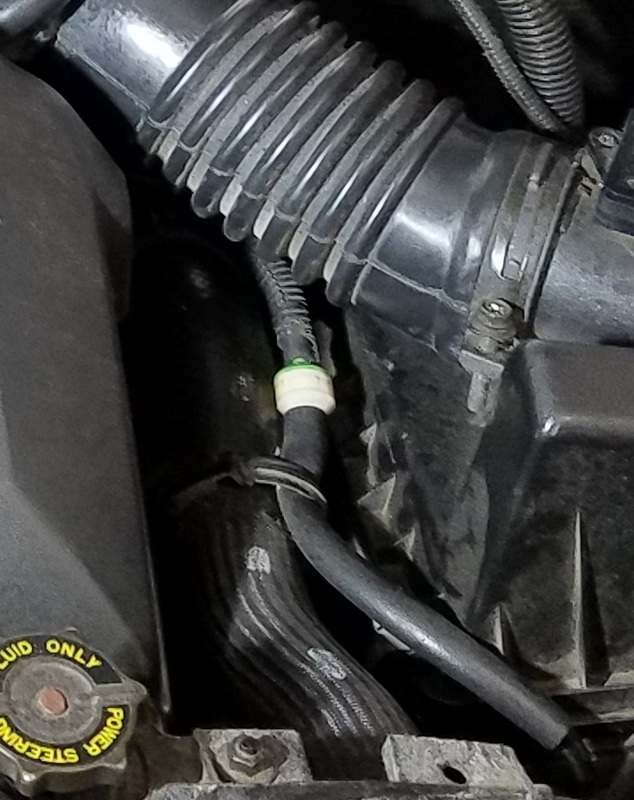 If you have a CAI, you need to remove this valve (has a green plug) from the airbox, plug in the sensor and just put it off to the side somewhere. @b1lk1 The VAD (Variable Air Duct) is code P1410. I have had that code and also had the solenoid unplugged. Later it failed and I pluged the vacuum line with a screw and eliminated it that way. The solenoid opens and closes the "extra air flapper" when you are open throttle. The green plug in the upp right of the picture is difficult to click into place and will give a P1410 MIL when unplugged or faulty. 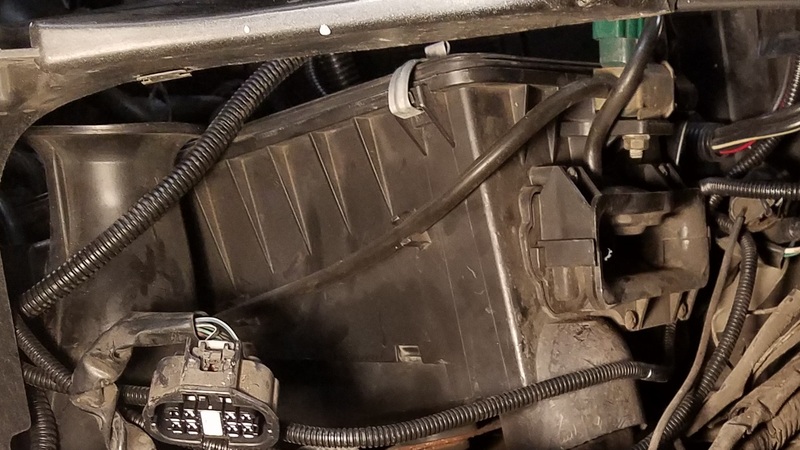 My diaphragm was immobile and could not be opened by have or with the solenoid so I disconnected the terminal end of the vacuum line and put a bolt into it to plug. It is also possible to disable the system by turning the VAD check valve pictured below (white/green) but I was unable to dislodge mine without destroying the hose and I had no spare handy. Huh, I was wondering what that green/white thing was, but not enough to bother looking it up anywhere. Thanks for saving me the time! @DrFeelGood thanks for the info. Any chance you found part numbers for the boost sensor solenoid and the baro sensor? I think these are the two sensors you are looking for. Cross check to verify. They may be salvage yard grabs. Check this link for updated stock numbers. Thanks Doc. I bench tested the solenoid valve and it worked correctly out of the car. I was a bit too lazy to perform the factory test for the baro sensor, so I just decided to buy one. The one you have listed above is almost correct, but I was able to find the right one after a bit of searching with the part number on the one in the car. I'll report back after I've tried it out. So in my obsession with a solution to this issue, I came across this post in another forum. It appears to be a non vehicle specific repair forum meant to help troubleshoot error codes and scan data from the OBD scanner. They are for the exact same two codes as this thread. The interesting thing I spotted was that the guy bench tested the solenoid and it did everything it was supposed to do, but it was still throwing the code. Eventually, he replaced the solenoid with a new one and the code cleared. It makes me curious if there's a resistance value in the solenoid that the computer wants to see. Regardless, I plan to change both the solenoid and the baro sensor (parts ordered) and will replace them when the new ones arrive. I'll report back. Both of these parts are made by Mitsubishi. Using one of the two links provided by @DrFeelGood above, I was able to buy the EGR boost sensor solenoid. The one the Doc listed for the baro sensor is actually a MAP sensor that goes in the air intake and is not the correct part for this application. It is likely the same gizmo inside the plastic, but the wrong orifice for the baro sensor needed for the EGR system. I found my Baro sensor on EBAY listed as an OEM part. I had thought I was getting another Mitsubishi part as that's what they had pictured, but it turned out to be manufactured by FAE. I was a little disappointed with that fact, but I will live with it as it is still a new part rather than used. After replacing these two parts and then driving to the parts store to have them clear the codes (I still don't have a code reader), I have now driven 100 miles and the check engine light has stayed off. The interesting thing is that the boost sensor solenoid checked out fine out of the car. It held vacuum as explained earlier in this thread and changed correctly when 12v was applied to the contacts. I didn't test the Baro sensor, as I was just a bit tired of the problem. So I'll never really know what was wrong, but it appears that the issue was with these two sensors on the firewall. 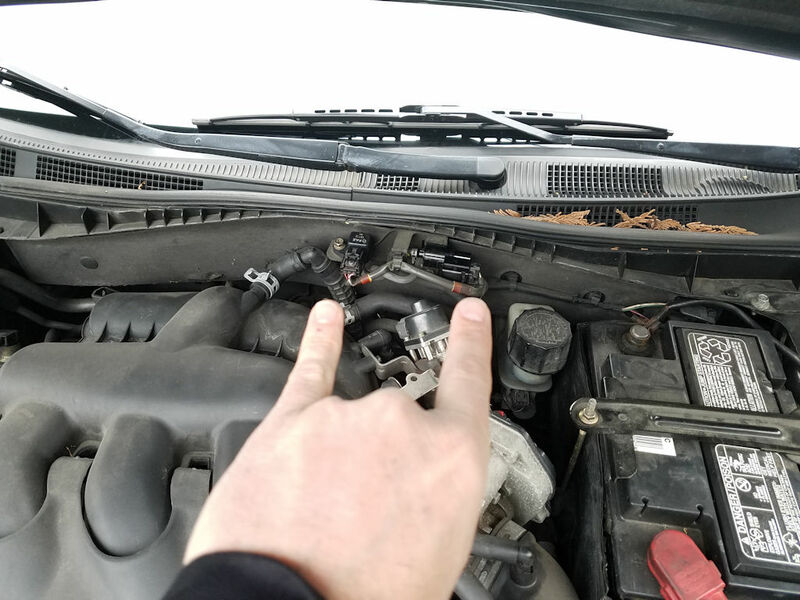 As I stated in an earlier post here, I did see some improvement (check engine light stayed off for a while) with cleaning the EGR probe tube, that did not keep the light off. I feel like it did need to be cleaned though, so I'd likely suggest that as part of this repair that the EGR tube should be cleaned and then those two sensors replaced on the fire wall. I'll be going in tomorrow to get my emissions test as I need to renew my tabs. I'll report back if it stayed off long enough to get to the testing station and if I indeed passed. I'm feeling pretty confident now that I've logged 100 miles though. Last edited by waughoo; 01-27-2019 at 07:23 PM.